The Intraoral Device in made of a soft flexible plastic to provide the optic media to deliver therapy inside the mouth. Using immediately before and after an oral procedure will improve the oxygenation of the blood supply, charge the muscular and skeletal systems for quicker healing, and reduce pain while accelerating recovery for the patient providing a drug-free solution. 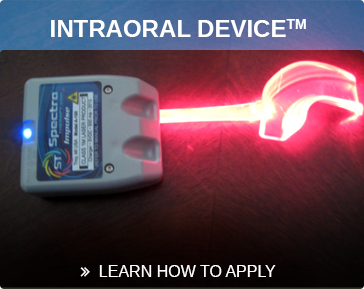 The Intra-Oral Device can be used to relieve pain associated with TMD/TMJ.